With the increasing needs for quicker data transmission speed in network, fiber optic cable is getting increasingly popular over the past few years. However, some people may still be all at sea of what fiber optic cable is. What is fiber optic cable and how does it work? Read this post below to get information about fiber optic cable definition and how a fiber optic cable works. Fiber optic cable, also know as optical fiber cable, is a type of Ethernet cable which consists of one or more optic fibers that are used to transmit data. 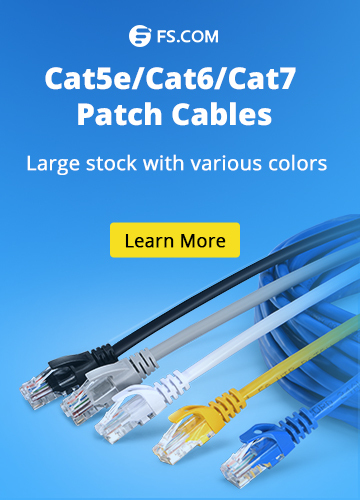 It is an assembly similar to an electrical cable while it is used to carry light and the fiber optic cable price is much higher than that of copper cable. Designed to use light pulses, fiber optic cables support long distance telecommunication and high-speed data transmission. Normally, fiber optic cable can run at a speed of 10 Gbps, 40 Gbps and even 100 Gbps. 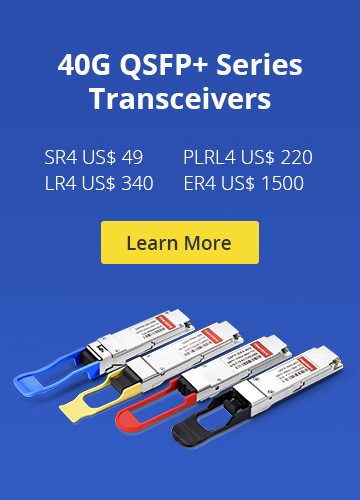 Therefore, it is widely used in much of the world’s internet, cable television and telephone systems. Generally, one fiber optic cable is made up of five parts: core, cladding, coating, strengthening, and outer jacket. The “core” is incredibly thin strands of glass or plastic known as optical fibers. The “cladding” is an insulated casing closely surround the “core” providing lower refractive index to make the optical fiber work. 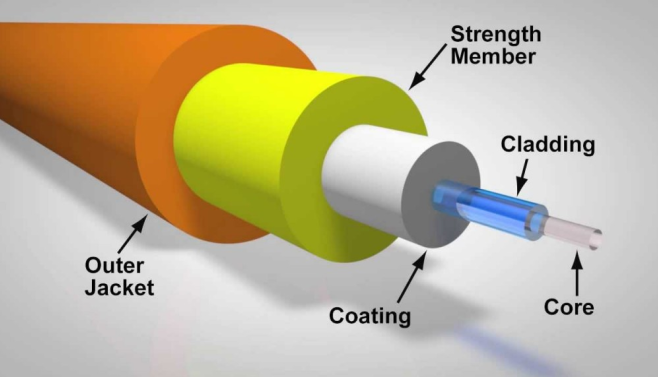 The ”coating” is a protective layer of the optical fiber. The “strengthening”, or strengthen member, helps to protect the core against crushing forces and excessive tension during installation. As the name implies, an outer jacket is used to protect the cable from environmental hazards. After solving “what is fiber optic cable”, “how it works” may be the top question related to it. Actually, light travels down a fiber optic cable by bouncing repeatedly off the walls. The fiber core and the cladding bend the incoming light at a certain angle with their own refractive index. 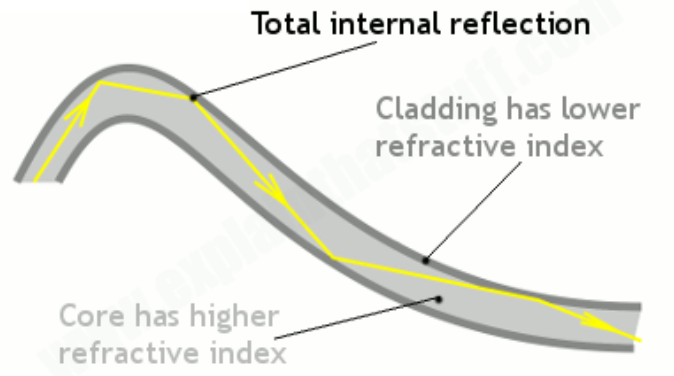 When light signals are sent through the fiber optic cable, they reflect off the core and cladding in a series of bounces, which a process called total internal reflection. Normally, fiber optic cable comes in two types, namely, single mode fiber (SMF) and multimode fiber (MMF). Single mode fiber has a very thin core about 5-10 microns in diameter while multimode fiber has a core diameter about 10 times of a single mode fiber. Generally, single mode optical fibers used in telecommunications operate at 1310nm or 1550nm wavelength while multimode fiber at 850nm and 1300nm. Compared with single mode fiber, multimode fiber has a limited transmission distance by model dispersion because it has a large core size and supports more than one light mode (from OM1 to OM5). 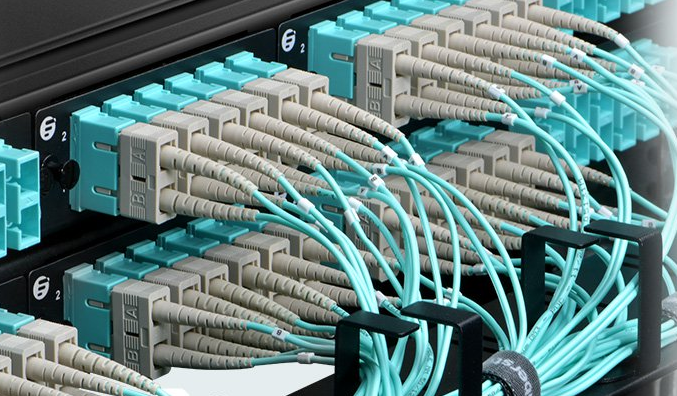 Single mode fiber is suitable for long distance applications such as 100km between buildings while multimode optical fiber is used in short distance transmission within buildings such as computer network linking. From all the above, you may have a general understanding of what fiber optic cable is and its working theory. Designed to use light pulses, optical fiber can offer quicker data transmission speed. In addition, it can meet different needs in transmission distance with both SMF and MMF. Fiber Optic Cables fiber optic cable definition, fiber optic cable price, fiber optic cable types, optical fiber, what is fiber optic cable. permalink.